Getting creative and making beautiful, handmade artwork is a way of life. But what if we told you that all your crafting is about to get easier? The Make Art Stay-tion by Wendy Vecchi for Ranger Ink is the crafting game changer you never knew you needed. 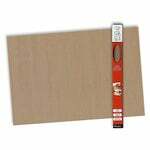 The steel magnetic base measures 12" x 12"
Each of the magnets measures 1" x 0.25"
The flexible magnetic ruler measures 12" x 1.25"
This magnetic workspace holds your projects securely in place, ensures precise alignment, and helps you produce wonderful results with ease. The best part is, it's perfect for at home, on the couch, road trips, on the airplane - almost anywhere you can think of! Constructed of one piece of solid, sturdy metal so that it won't bend or warp when you're working with it. Even though it's metal, it's lightweight and easy to pick up and move. Take it on-the-go! It's perfect for crafting on the couch, on an airplane, in the car, or anywhere else the mood strikes! 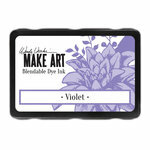 No sharp edges - the corners of the Make Art Stay-tion are rounded. 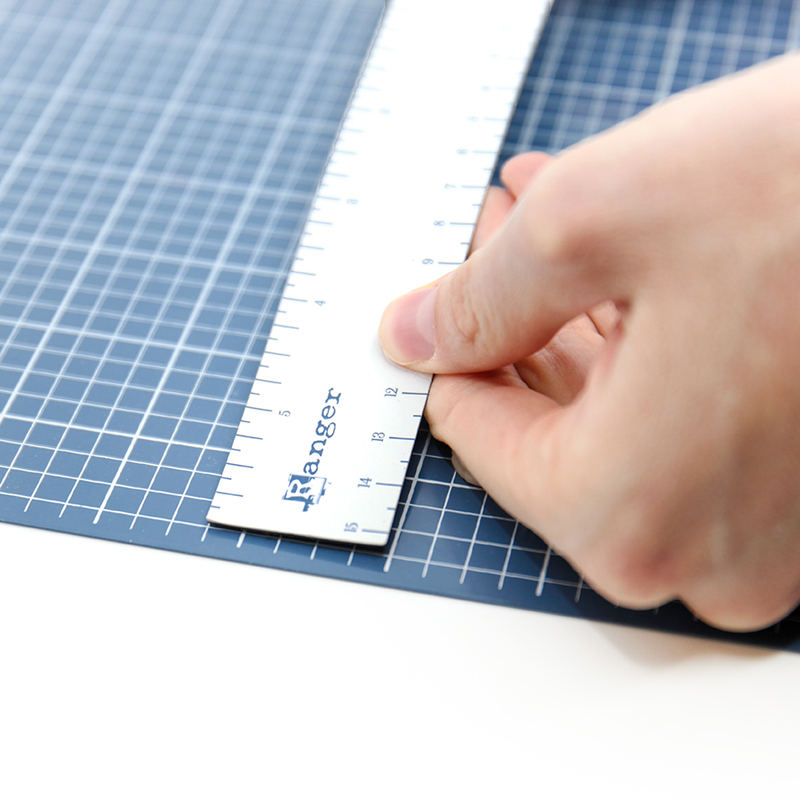 The ruler is 12", with a center mark for perfectly-centered projects. Can easily be used one-handed, or by those who have limited mobility in their arms, hands, or fingers. 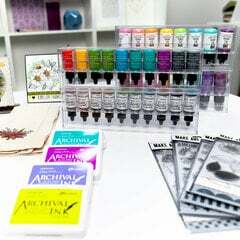 If you've ever wanted to get perfect stenciled shapes and sentiments with ink, blending, paints, glazes or other mediums - this is the tool for you. The strong magnets and precision work surface ensure that your stencils stay exactly where you want them to so you get perfect transfers while you make a masterpiece. 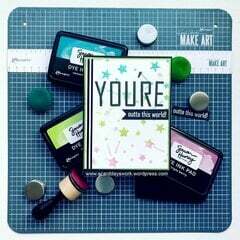 If you want to get perfectly centered, absolutely aligned sentiments stamped on your cards every single time, Wendy Vecchi may be your hero. The Make Art Stay-tion is a wonder when it comes to getting all the perfect little touches and accents right the first time. For stenciling, line up your paper or cardstock and place the stencil over it. Secure both pieces in place with your magnets. 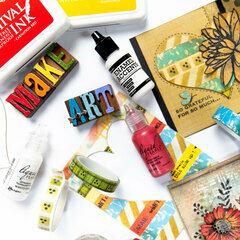 Your paper and stencil won't slip or slide as you're blending, adding ink, mediums, or paint in a fun, stenciled design. 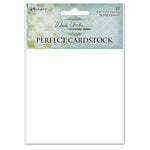 If you want to ensure your stamps and sentiments are perfectly straight and aligned, place your card on the grid and secure it in place with the magnets. 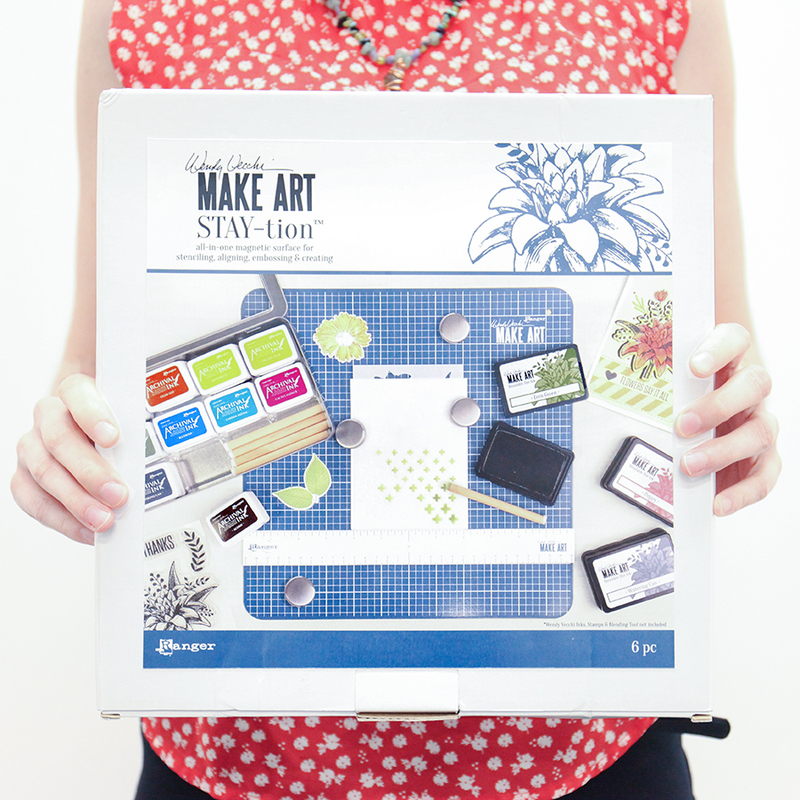 Use the magnetic ruler to find a straight edge in alignment with the lines on the Make Art Stay-tion and then get stamping! For heat embossing, you'll want to grab a non-stick, heat resistant craft sheet and secure it to the grid using the magnets. 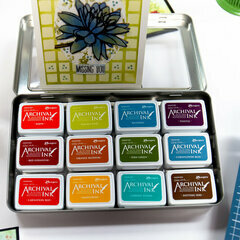 Place your project on top and then have some fun with your embossing inks, powders, and heat tool. Use caution, as the Make Art Stay-tion will become hot. Create however you like! 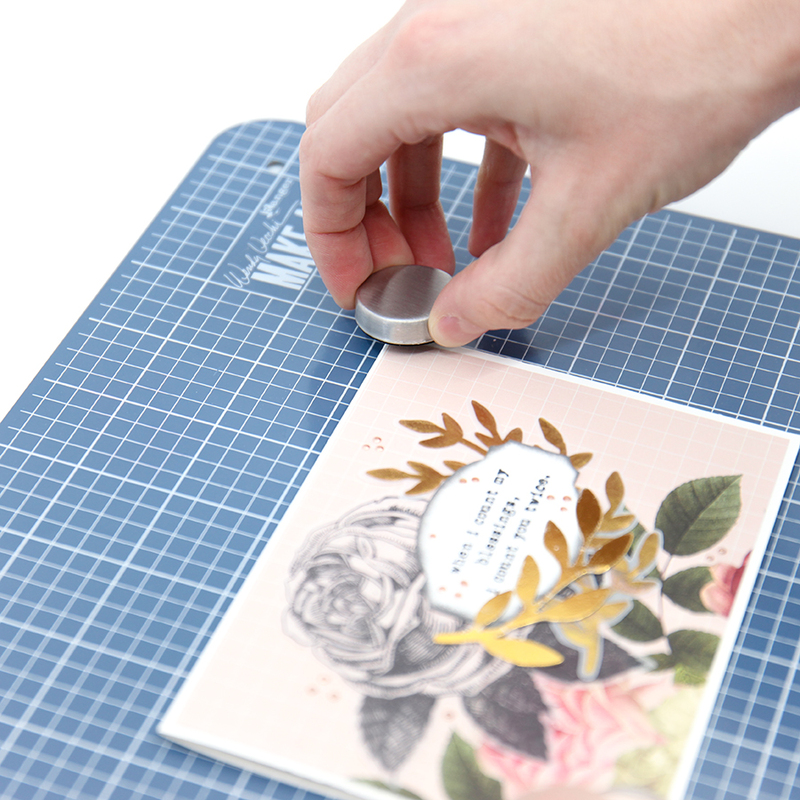 The magnets will hold a card or project in place so you can add layers, die cut pieces, accents, embellishments, and more without shifting as you work! One of the best features of the Make Art Stay-tion is its portability. Its sturdy and lightweight magnetic design means that you can take it and your project in progress with you wherever you go. Slide it into your tote bag, your carry-on, or just grab it as you hop in the passenger seat for a road trip. Your sketches, cards, layouts, coloring pages, doodles, journal cards, and everything else will stay in place as you work! 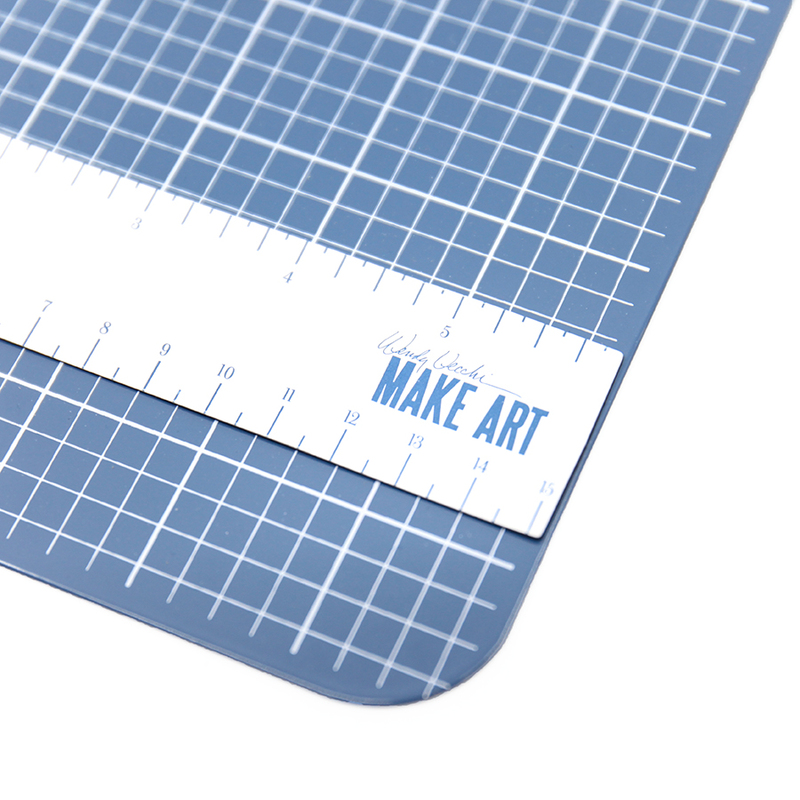 Do not use the Make Art Stay-tion as a cutting surface, as blades will damage it the metal and grid lines. The magnets are strong - handle them with care to avoid getting pinched. 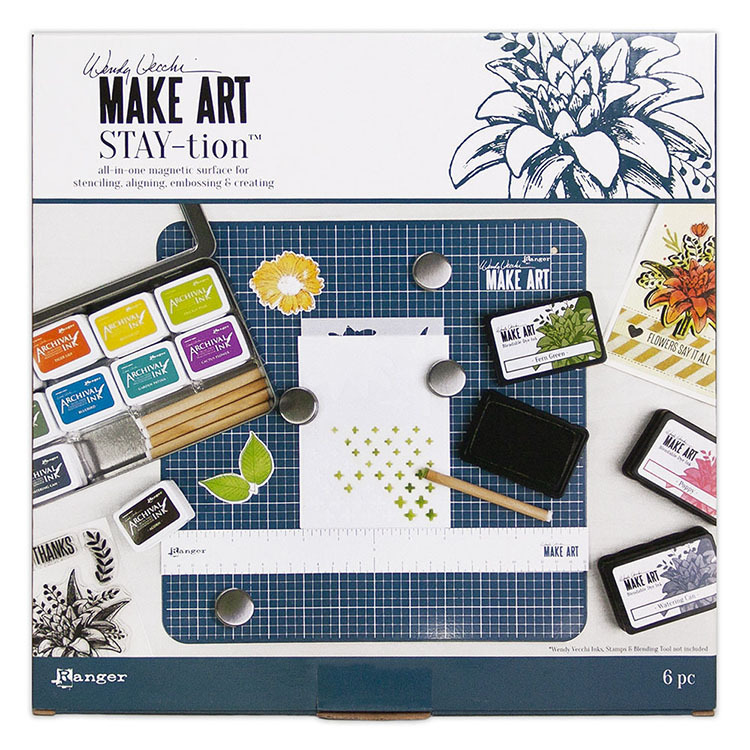 If you're looking to make a creative mess with paints, glossy accents, or inks, use a non-stick craft sheet on top of your Make Art Stay-tion. If you're using a heat tool, it's best to use a heat resistant craft sheet on top of the base. Also, try to keep your project in one corner of the Make Art Stay-tion to avoid the entire workspace getting too hot to handle. Ensure that it is fully cooled down before handling again. Clean up is so simple - grab a damp cloth and a little bit of dish soap to gently wipe the surface and you'll be good to go! Make clean up even easier when you use a Ranger Non-Stick Craft Sheet on top of your Make Art Stay-tion. This amazing tool is exactly what you need to transform the way you craft. You'll be blown away by the perfect results in your stenciling, stamping, heat embossing, drawing, coloring, and everything else. It will be your new go-to work surface for home or on-the-go when crafting inspiration strikes. SO GLAD I BOUGHT THIS ITEM, JUST THE RIGHT SIZE TO TAKE WHERE NEEDED AND HOLDS EVERYTHING JUST THE WAY NEEDED .NOTHING MOVES WITH THE MAGNETS AND THEY DO NOT PINCH YOUR FINGERS. DO NOT KNOW I WAS ABLE TO DO THINGS WITH OUT IT. SAW IT USED AND KNEW I HAD TO HAVE IT! A must have for crafters! I am very pleased with the Make Art Stay-toon. 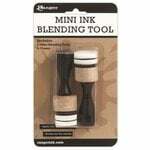 I have been using it now for several days with stencils. The magnets hold the stencils down solidly and they do not move at all. The magnets are as described, easy to separate, stack nicely, and hold yiur item stightly to the surface. The Stay-tigon surface cleans easily and is ready to go again. Very pleased. I initially bought this for the reason it was invented .... to hold stencils in place. I am learning calligraphy. I find it very helpful to keep my original sheet and copy sheet in order also. I brought it to my class and my instructor said she needs to get one of these. A brilliant idea to create beautiful, accurate stencil imprints. Four strong magnets included keep everything in place while you work. The grid ensures that straight lines are easily maintained. Good quality, easy to travel with or stay at home. Love it! 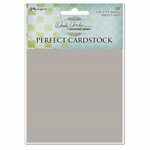 Need the card, tag or whatever papercraft you're creating to stay put? Well metal and magnets work! 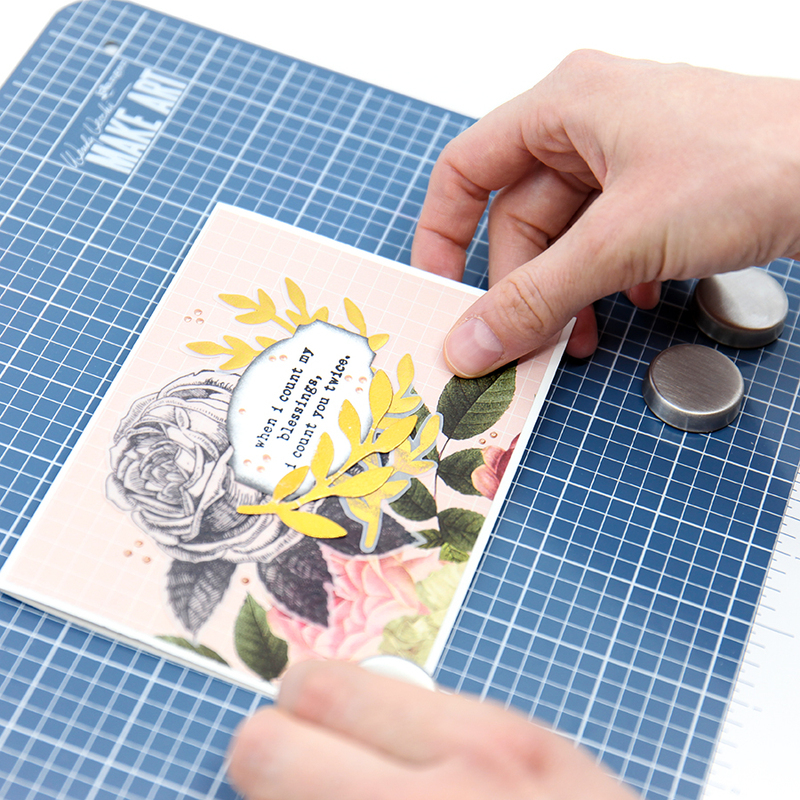 Gridlines and magnetic ruler are all part of the design to aid you with your paper crafting. Good, manageable size too. A must have. 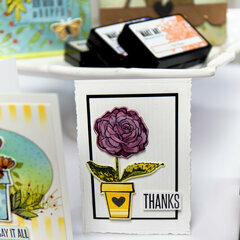 This is perfect size for stamping or working with cards. Seems very durable and cleans up easily. This keeps my pieces all in one place while arranging and rearranging items for my project. Nice to have something to hold my work down, so it doesn't fly off the table. Great addition to my Art Supplies! This is an excellent tool....perfect for my work space. Can I pre-order 2 or 3 of these? By: kfischer (01-Apr-19) Helpful Question? Yes | No Thank you! Report Inappropriate This question has been reported. Thank you! Hi! Unfortunately, Scrapbook.com does not do pre-orders, however, you can click the purple "Notify Me" button and they will send you an email as soon as the Make Art Staytion arrives :) By: Sarah Richards (01-Apr-19) Helpful Answer? Yes | No Thank you! Report Inappropriate This Answer has been reported. Thank you! How easy does the mat clean up after spray stains, paint and archival ink? By: ladyleda2 (24-Feb-19) Helpful Question? Yes | No Thank you! Report Inappropriate This question has been reported. Thank you! The manufacturer did not answer this individual's question. The questioner specifically asked about the mat's integrity, re: it's cleanliness. For all we know the older protective mat was already in use. By: Phyllis_Herrin (09-Apr-19) Helpful Answer? Yes | No Thank you! Report Inappropriate This Answer has been reported. Thank you! We suggest you use our Non-Stick Craft Sheet (NSC20677) on the surface when using fluid type mediums as well as Archival Inks. By: Ranger Ink (01-Mar-19) Helpful Answer? Yes | No Thank you! Report Inappropriate This Answer has been reported. Thank you! How much is shipping for this By: meverts (07-Apr-19) Helpful Question? Yes | No Thank you! Report Inappropriate This question has been reported. Thank you! My shipping costs for entire order, which included the Make Art Stay-tion, was $8.99. No idea how much for just the Stay-tion By: harlynl54 (08-Apr-19) Helpful Answer? Yes | No Thank you! Report Inappropriate This Answer has been reported. Thank you! Hello! It depends on where you live. If you add this item to your cart, in your cart you will be able to calculate what the shipping cost would be before you commit to purchasing :) then you can make a decision from there. Hope this helps! By: Sarah Richards (08-Apr-19) Helpful Answer? Yes | No Thank you! Report Inappropriate This Answer has been reported. Thank you!